The location of Amazon’s HQ2 in Arlington County would generate significant impacts to the benefit of the County’s and Commonwealth of Virginia’s economies. These economic and fiscal impacts would be seen in job and income growth including the HQ2 workforce and the supporting jobs and personal and business earnings that would be generated annually by HQ2, its workforce, and their families by their spending for goods and service within the Arlington County economy and throughout the Commonwealth of Virginia. This new economic activity would generate substantial new revenues in excess of new public expenditure requirements for both Arlington County and the Commonwealth of Virginia. These economic impacts would be generated by the construction and related activities to supply the 8 million square feet of office space needed to house up to 50,000 jobs planned for HQ2. These outlays would occur over a proposed base-case period of 20 years (see Appendix II Table C for details). With the occupancy of renovated and newly constructed office space, Amazon’s outlays to operate its business functions at HQ2, daily spending by its workforce and household spending by Amazon workers’ households residing in Arlington County would generate economic benefits in support of the County’s local business base spanning the breadth of the local economy with these benefits recurring annually. The magnitudes of these economic impacts would be a function of the number of workers comprising the HQ2 workforce in any year building up to the planned total of 50,000 jobs and the number of Amazon workers’ households choosing Arlington County as their place-of-residence. In this analysis, total impacts are estimated for the build-out year. These economic impacts can be annualized or calculated for intervening years by prorating the end-period totals according to the projected pace of hiring for the intervening years. 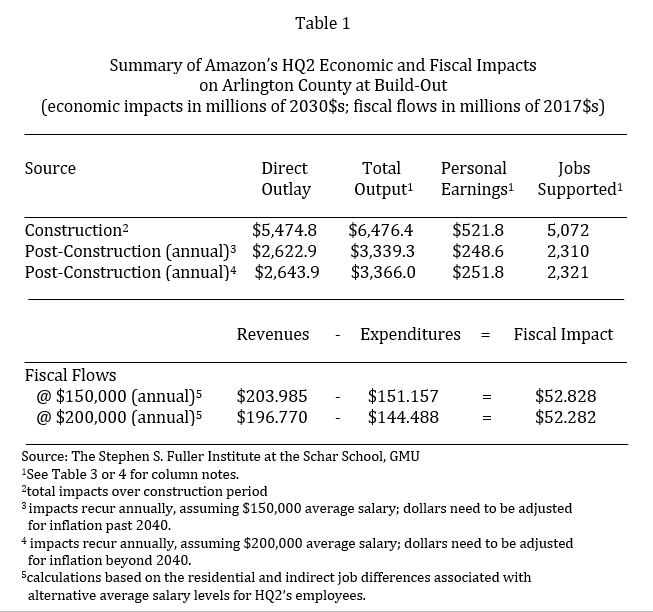 The direct outlays associated with HQ2 construction, operations, and daily worker and annual household spending would generate additional impacts on the Arlington County economy as these outlays are recycled through the County’s economy generating new payroll supporting non-Amazon jobs and generating business transaction that further expand the County’s and State’s economies. Some of these impacts would also extend into the economies of the District of Columbia and Maryland; for example, it is projected that approximately 30 percent of HQ2’s workforce would choose to reside outside of the Commonwealth of Virginia. 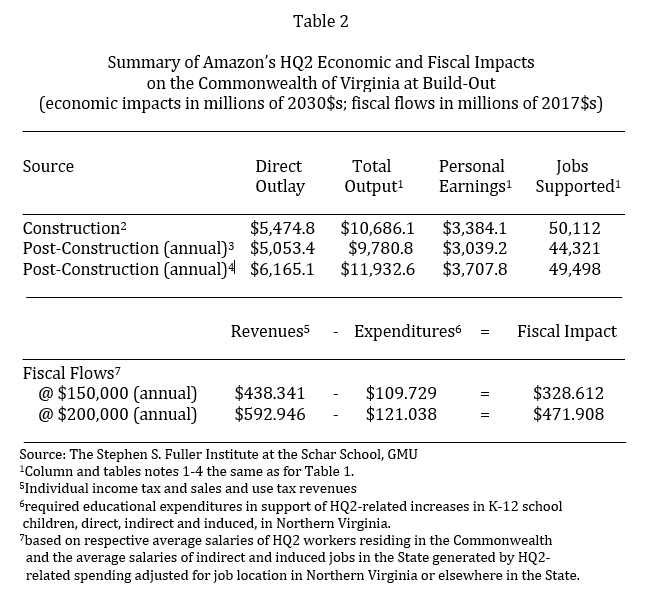 The economic and fiscal impacts accruing to Arlington County, as the headquarters site for Amazon, are summarized in Table 1 while the economic and fiscal impacts flowing to the Commonwealth of Virginia, inclusive of Arlington County, are reported in Table 2. Construction outlays associated with building out the office space requirements totaling 8 million square feet to house Amazon’s HQ2 in Arlington County, including site preparation and on-site infrastructure, soft costs, renovation and new construction and tenant improvements, would total approximately $5.5 billion and contribute an estimated total of $6.5 billion to Arlington County’s economy over the construction period. These direct construction outlays would also generate up to $521.8 million in new labor income over the construction period to the benefit of workers residing in Arlington County, supporting up to 5,072 jobs in the County and, in total, would generate $3.4 billion in new personal earnings and as many as 50,112 full-time, year-round equivalent jobs within the Commonwealth of Virginia. The direct new annual spending in Arlington County generated following completion of construction is estimated to total $2.6 billion and to contribute $3.4 billion to the Arlington County economy. HQ2’s projected 50,000 on-site jobs would support a payroll ranging between $10.0 and $13.3 billion annually with an estimated fifteen percent of these jobs (8,218 to 7,265 depending on average salary level) held by workers residing in Arlington County and 69.5 percent (34,727 to 34,578 depending on average salary level) living in the Commonwealth of Virginia. Direct post-construction spending would support an estimated 2,310 to 2,321 indirect and induced new jobs in Arlington County and from 44,321 to 49,498 new jobs statewide spanning the breadth of the economy. This new economic activity would generate annual fiscal benefits of $52.3 to $52.8 million for Arlington County and from $328.6 to $471.9 million for the Commonwealth (in 2017$s).